Even in the darkest and most cruel person, there is still a kernel of good. And within the most perfect champion, there is darkness. The question is, will one give in to the dark or the light? It's something we decide with every choice we make, every day that we exist. What might not be evil to you could be evil to someone else. Knowing this makes us powerful even without magic. All these men saw when they looked at her was a little girl who’d run away on a whim to search for magic seeds. Who caused trouble. Who was utterly useless in every way except looking pretty. Maybe she was. And if that was true, then being here was only causing more problems for her father. Finally Cleo nodded and turned away. Falling Kingdoms by Morgan Rhodes (Michelle Rowen) is a downright good read. Marketed as part of Penguin's Breathless Reads collection, it's a thoroughly captivating and deliciously readable YA fantasy novel that will appeal to fans of George R. R. Martin's bestselling high fantasy series, Game Of Thrones. Personally, I could not put this book down. Told from multiple perspectives, richly imagined and packed with eye-popping action, it's truly a breathless read, and one that I will be recommending to all my friends! The story focuses on three kingdoms: Auranos, Paelsia and Simeros. The kingdoms managed to co-exist in peace for many years, but when a wine maker's son is killed by a lord from another kingdom, the established peace is threatening to crumble. There is a war brewing and four seemingly unrelated young people find themselves caught in the middle of it. Impressive world building, thorough character development, intrigue, magic, action, romance... Falling Kingdoms has all that and more! At more than 400 pages, it's not what you'd call a short book, but Rhodes' sharp and concise prose makes it all-too easy to lose yourself in the story and forget the real world for a day or two. With her skilled storytelling, she created a world that is mystical, but believable nevertheless. A visually breathtaking, emotionally stimulating, intensely gripping page-turner of a book! As I mentioned before, each chapter of the book concentrated on a third-person point of view of a different character. I thought the third-person narrative provided a good (objective) look at all sides of the conflict, though at times I wished the story was told in a more personal first-person narrative instead. Mainly because, while third-person narrative explored the thoughts, feelings and motivations of all four main characters, it did not make their voices distinct enough. That, of course, doesn't mean that I found the characters underdeveloped, I just thought it would've been really interesting to fully explore their unique personalities. Overall, though, I thought Rhodes did a really good job juggling the multiple characters and skilfully intertwining the story lines. The result was simply amazing: the plot line was full of interesting tidbits of information, fresh ideas and surprising plot developments. The story was a complex and multi-layered one, but not overwhelmingly or confusingly so. I really enjoyed Rhodes writing style. It was more YA and MG-friendly than your usual high fantasy book and I found it easy to read and understand. The descriptions were rich in details, the dialogues - realistic. I loved the intrigue and how fast-paced the story was. I also really appreciated the fact that Rhodes was not afraid to kill off some of the characters and trust me when I say; some of these kills were real jaw-droppers! 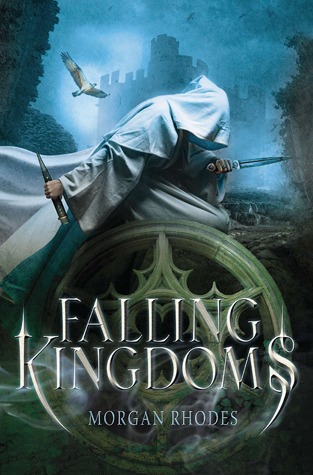 All in all, Falling Kingdoms is a fresh and exciting YA fantasy novel that is sure to please a wide range of reading tastes. This book has everything from action and political intrigue to magic and romance. You really don't have to be a high fantasy lover to enjoy this story. The epic scope of the first book in the series promises a fantastic and unforgettable journey and I can't wait to read the next instalment! I'm so excited for this one! I'm thinking about buying it for my Kindle so I can read it sooner. I love fantasy novels. I'm glad you thought the author did a good job with the multiple points of view! Though I don't really read a lot of fantasy, this book sounds really awesome!! Yours is the first review that I have read that points out that it's written in 3rd person perspective though, and I tend to have a really hard time with that. I just feel a lack of connection to the characters. There are books where I have enjoyed it though, so I wouldn't not read it because of that, but it's good to know. Fab review chick!! I haven't read Game of Thrones but I'm intrigued because the genre has piqued my interest a bit. I like fantasy that leans more toward MG. The first ever really fantasy series I read was David Edding's Belgariad series and it was a lighter, younger tone that still managed to tackle some big issues and such. I really want to read this one, because I'm a HUGE sucker for YA fantasy. Amazing review, Evie. I don't even know where to start, so I'll just leave it at that! I like high fantasy, but I don't read a lot of it because it takes serious amounts of....concentration, I guess is the right word. There is no way though, that I will pass this one over. It sounds phenomenal, and the cover is amazing. And, you liked it, so that it another point in its favor. I also like that it is an easier high fantasy than most. "A downright good read" sounds good to me - as does its readability. Like Jaime, I find that high fantasy can be a bit brain-depleting, but I like the writing style of the two excerpts you give here. The cover is fabulous. And fast-paced, intrigue, jaw-dropping killings...? Definitely appealing! I can not wait to read this one... Wonderful review. It sounds fantastic. Again, another great review. I can't wait to read this one. I've been dying to read this book, you make it sound exciting as well, can't wait to get my hands on it! Well now I have a new book to add to my reading list. I love classic style fantasy, and finding more of it is a great challenge. I'm just wondering if I can share it with my 7 year old niece or if she would be too young? Hi @Katie! :) Thank you for your comment! :) I am sure you'll love this book! I wouldn't share it with your niece, though. There is some violence in it and the author is not holding back at times (some characters die, too!). It might not be suitable for your niece. I'd recommend Small Medium At Large by Joanne Levy or Storybound by Melissa Burt! :) Both beautiful, fun and super enjoyable for younger kids!